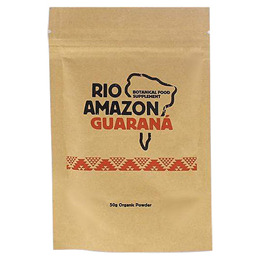 Guarana is a creeping shrub native to the Amazon rainforest that produces clusters of small bright red fruit, the seed of which has been used by indigenous tribes for centuries to help to reduce mental fatigue, and to help maintain mental awareness. Powdered form ideal for use in smoothies. Blend half a teaspoon (1-2g) of powder into fruit juice, water or your favourite smoothie and stir well. For best results, add just a little liquid (i.e. juice or water) to the required amount of powder and mix into a ‘paste’, then add this to the full volume of liquid. Do not exceed the maximum daily dose. Caution: Contains caffeine (4%). Not recommended for children or pregnant women. Below are reviews of RIO AMAZON Organic Guarana - Energy - 50g Powder by bodykind customers. If you have tried this product we'd love to hear what you think so please leave a review.